To promote the use of magnifying loupes in surgery, Roboz Surgical has announced that it is offering a 20% discount on a wide range of loupes and LED lights when purchased together. Most researchers perform procedures at a very small scale. While they realize that their procedure requires the finest instruments, such as micro scissors and micro forceps, few use any kind of magnification when it’s not absolutely necessary. Instead, people try to see more by simply getting closer. Bending over to see and work with small objects with precision can produce serious eyestrain and back problems due to poor posture. This can lead to long-term debilitation and discomfort. The use of magnifying loupes instantly alleviates these problems by improving vision and allowing for a more normal posture. The benefits of using loupes are many. With 2.5, 3.5, or 4 times magnification it is easy to see the minutest details more clearly in order to perform the most delicate of surgical procedures. A magnification of 2.5X offers a wide field of view and greater depth of field, allowing for the monitoring of a broad work area and more freedom of movement. Higher magnification comes at the price of smaller fields of view and more limited flexibility in working distance, but reveals incredible detail with the finest accuracy. Magnifying loupes also eliminate the need to bend forward, reducing eye, neck, and back fatigue. Moreover, unlike microscopes, loupes move with your head, providing much more freedom of movement and fast, easy repositioning of work areas. Accompanying glasses and side protectors also prevent eye contamination, while a hinged, flip-up design provides excellent optical alignment and makes the transition between magnified and normal vision a snap. Optional attachable LED lights offer intense, adjustable illumination. Bright, pure white light is provided for between 4 and 7 hours, depending on intensity level, by a rechargeable battery pack that clips onto a belt or pocket so that users can move around freely without having to be near an electric outlet. 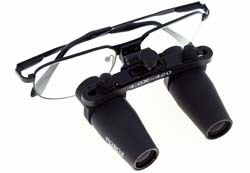 More information on surgical loupes and accessories, as well as the promotion code, may be found in the Magnifying loupes section of Roboz’s online catalogue at shopping.roboz.com. About Roboz Surgical: Roboz Surgical is a leading supplier of superior quality surgical instruments and related products for the biomedical and life science research industry. The company offers over 1000 fine surgical instruments including a wide variety of tweezers and forceps, scissors, scalpels, bone instruments, retractors, surgical and vascular clips and clamps, wound closure and vascular access instruments, instrument care and handling products. Roboz Surgical is based in Gaithersburg, MD.